Authorizer PRO can accommodate the simplest to the most complex workflow scenarios within the parameters of travel policy rules. 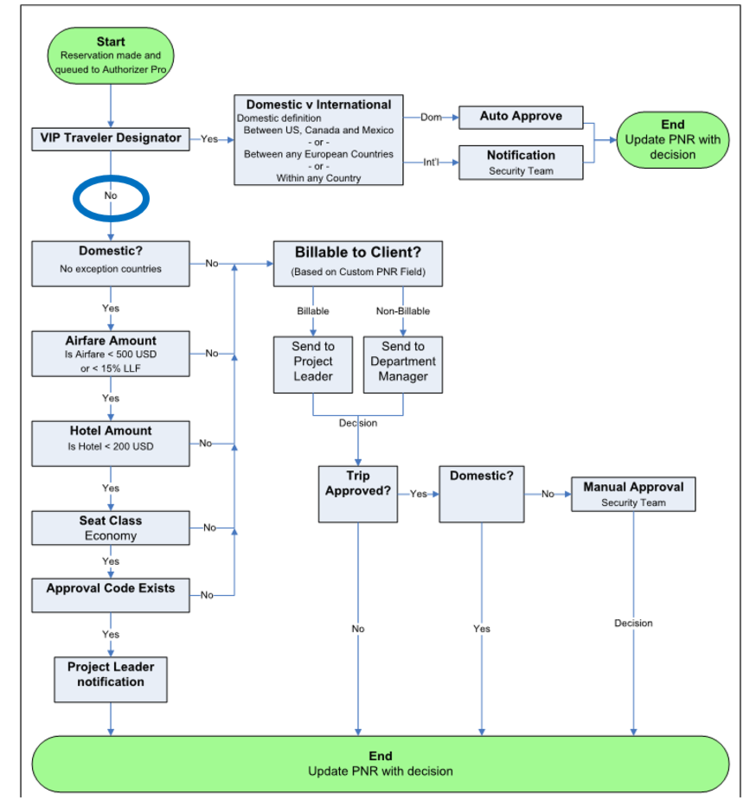 The diagram illustrates a workflow of moderate complexity to help you envision how AuthorizerPRO automates decision support based on corporate policy and process requirements. To demonstrate the workflow at hand, we have created two mock scenarios for you to follow along. Imagine the diagram is a game board. Let’s move the pawns. First, we examine the workflow of a C-suite executive. The executive has been invited to Honduras to receive a humanitarian award on behalf of the corporation. A corporate travel agent creates a PNR in the company’s queue on the GDS. Once his PNR is in queue, our system takes over. Authorizer PRO runs the PNR through custom workflow conditions set forth by his corporation and its travel policy. The first set of rules in the example workflow establish whether the traveler is a VIP. In this case, our traveler is a VIP, therefore his PNR undergoes a unique set of rules that vary from a non-VIP traveler. The second workflow rule assesses whether the flight is domestic or international. Since Authorizer PRO allows corporations to create custom definitions for rule criteria, this mock corporation was able to define Domestic as ‘all flights between the US, Canada and Mexico,flights between any European countries or within any one country’. Per policy, all domestic flights for VIPs are automatically approved. But this VIP traveler’s flight reservation is international. Based on his company’s requirements, even if the flight is international, it is auto-approved but the corporation requires an email notification sent to the security team. The VIP traveler’s PNR is automatically approved and updated with the decision in the GDS for ticketing. What if our traveler is not a VIP? Let’s take a look at the workflow for an account manager based in Chicago, IL, who is traveling to a large, prospective client in Houston, TX. Unlike the executive above who used a travel agent, the account manager places her reservation using an Online Booking Tool (OBT). Authorizer PRO handles both online and offline reservations via identical or differing processes. Queued by the OBT, her PNR funnels through an entirely different set of parameters than the VIP. The first rule checks to determine if her flight is Domestic. Since she is flying between two US cities, which is considered a Domestic flight based on her corporation’s definition, her PNR progresses to the next rule. The next rule asks “What is the airfare amount?” In this case, the mock corporation has decided it will auto-approve any flight under $500.00 US dollars or less than 15% of the value of the lowest logical fare (LLF). Her fare is within policy at $432.96 round-trip. Since all of the initial rules are met, the account manager’s PNR is approved. Her project leader gets notified of the decision via email. The PNR is updated with the decision in the GDS, and is eventually ticketed. What if the account manager PNR violates one or all of the above rules? In that case, her PNR goes through a set of follow-up questions to evaluate further. *This ability to chain one set of rules to another is a key advantage of Authorizer PRO’s rule-chaining technology that can accommodate complex or irregular booking scenarios. The first rule of the secondary workflow path checks whether the flight is Billable to her prospective client in Houston. Since this flight is billable, the PNR is sent for manual approval to the project leader. If her trip was not billable to her client, then it goes for manual approval by the department manager. If the trip was declined by the project leader or the department manager, the required changes are entered by the approver and the PNR is updated in the GDS. Since our traveler’s request was approved by the Project Leader and her flight is domestic, the PNR is updated with the APPROVED decision and placed on the ticketing queue. After the PNR is approved by either party, it must be ruled as a domestic or international flight in order to determine if the Security Team needs to be involved in the final decision. All declined PNRs are queued to the TMCs for changes and resubmitted for approval in Authorizer PRO until an APPROVED status is achieved. The workflows in our diagram reflects the exact guidelines and processes dictated by a corporation & its travel policy. Authorizer PRO is essentially the virtual version of corporate travel policy. Since the possible booking scenarios become quite complex, Authorizer PRO’s Rules Engine is fully customizable to manage them so that most, if not all trips, are auto-approved and 100% compliant. Automating the pre-authorization process through Authorizer PRO results in significant cost savings for a corporation and substantial reduction in time spent on manually approving trip requests. It is Authorizer PRO’s customization and automation capabilities that truly set it apart. While other pre-trip authorization platforms could manage a simple set of rules, Authorizer PRO accepts an unlimited number of rules and levels of approval into its workflow. For more information about how Authorize PRO can modernize your corporation’s pre-trip approval process, Contact Us today.